Tests can be timed or not timed. If timed, you can choose the maximum amount of time you will allow candidates to complete a test. Tests can be scored or not scored. If scored, you can enter the minimum score a candidate should achieve to successfully pass the test. Tests can be set so that everyone receive the same questions or they can be pulled randomly from a larger pool of questions. You can configure the tests to allow candidates skip questions in order to answer them at the end of the session. 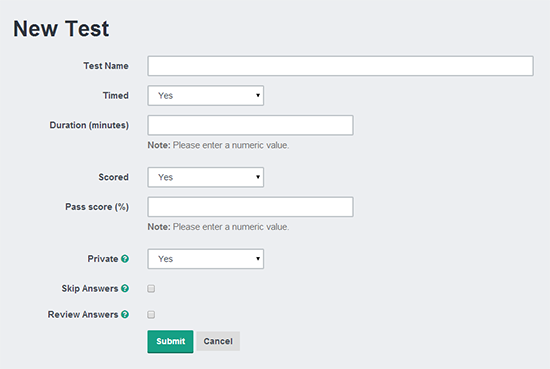 You can configure the tests to allow candidates flag questions in order to review them at the end of the session. By default all tests you create are private which means only candidates you add can take the tests based on the PIN code they receive. However you can also create public tests (with public Url) that you can distribute via job ads or your website so that anyone can take it after they enter their basic information (name/email).